Cut yourself a slice of English pastoral folk with the vinyl reissue of the first album by legendary prog-folkies Heron, from Berkshire, UK. Formed in 1967 having met at the Dolphin Folk Club in Maidenhead and inspired by Dylan and the early Incredible String Band they eventually signed to the Dawn label who released their self-titled debut in 1970. The band didn’t enjoy the whole studio experience so opted instead to record the album outside. They set up mics in a field in Appleford, Berkshire which turned out to be just a few miles from Traffic’s own rural retreat in Aston Tirrold. They performed their music surrounded by trees and the birds which gave the album a lovely relaxed vibe. They adopted the same approach on their second album Twice As Nice & Half The Price (1971) which was recorded outside a Devon country cottage. 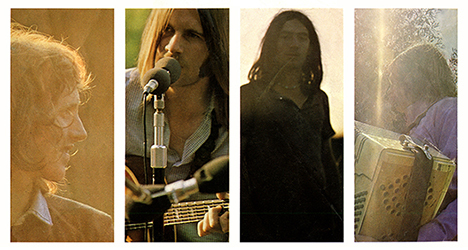 According to their biography they were constantly beset with untimely issues, one of which nearly led to a hit single: Despite their Radio One session debut in January 1971 as part of John Peel’s Sunday Concert, sales of the Heron album failed to pick up. What was needed to break the band, it seemed, was a hit single. It almost happened. Released in April, the maxi-single featured four tracks (a fifth song, ‘Friend’, was recorded but omitted at the last minute – sadly this track no longer survives in the Pye/Dawn archives) including a suitably bucolic take on Dylan’s ‘Only A Hobo’ and, as lead track, a hook-laden G.T. Moore song entitled ‘Bye And Bye’. With the normally influential Tony Blackburn making it his Record of the Week, ‘Bye And Bye’ received copious Radio One airplay, as Steve Jones recalls. “Everyone was playing it – Tony Blackburn, John Peel, Radio Luxembourg’s Kid Jensen… suddenly it was all happening! And we sat back, just waiting to be millionaires. Instead of which, you just couldn’t buy the single. Apparently there’d been a vinyl problem initially, so they only pressed one or two thousand copies. Then there was a strike of delivery van drivers, so you just couldn’t get the single. From being on a high, suddenly we plummeted. It took a lot of steam out of us.” Despite the lack of imapct it is still widely acknowledged as an Acid Folk masterpiece and now you can have a part of that history. Mapache issues this album for first time from 1970 and it comes with the original gatefold design, an insert with an interview to the band and the hard to find first Ep from the band as a bonus 7′ featuring Only a Hobo, Bob Dylan’s cover plus three more extra songs not included on the album.